Solid Blue color with side mirror pockets. Material - 210T Polyester taffeta, super soft, Water resistant fabric. Double stitched seams with Customized Fitting and Perfection. Allows heat, moisture, damp, and condensation to escape easily. Features a built-in strap and buckle system to keep car cover secure in windy conditions. Elastic is used for front and rear of the cover for custom fitment. 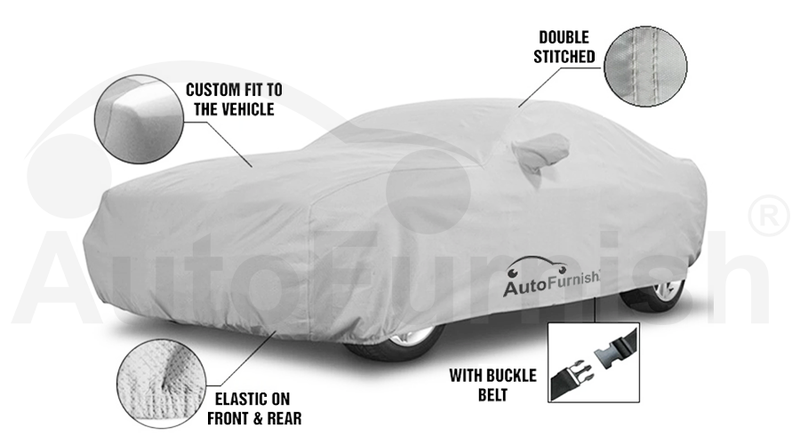 Being a manufacturer, Autofurnish car covers are tailor stitched for your specific vehicle keeping in view exact year, make, model, body type, trim and other specifications of the vehicle. Autofurnish Parker Blue Car Body Cover is a new stylish and elegant printed stripes design which gives a whole new look to your car. Cover includes side mirror pockets which are made precisely to the size of the mirror. This car cover is made of Superior 210T Polyester taffeta material which protects your vehicle against wet, humid and dusty climatic conditions. This cover allows maximum air circulation under the cover, assures that any moisture or condensation under the cover can easily evaporate, and reduces heat on hot days. Double Stitched High Quality imported threads used to stitch the cover tight and securely protects your vehicle against natural pollutants, animal droppings, tree sap, industrial pollutants, and airborne dust and dirt. The inside material of the cover is very soft and is designed specifically to avoid any damages to the vehicle's paint during the course of removal or putting up the car The cover is Machine washable , Easy for handling and storing. 1. This body cover is water resistant which means it is able to resist the penetration of water to some degree but not entirely. 2. It is advisable to use new cover on sunny weather for first few days before using it on wet/rainy weather to avoid initial color bleed. 3. The images represent actual product though color of the image and product may slightly differ. Silver Color with side mirror pockets. Protects for your vehicle from UV rays, dirt, dust, rain, snow, ice, industrial pollutants, and bird droppings.